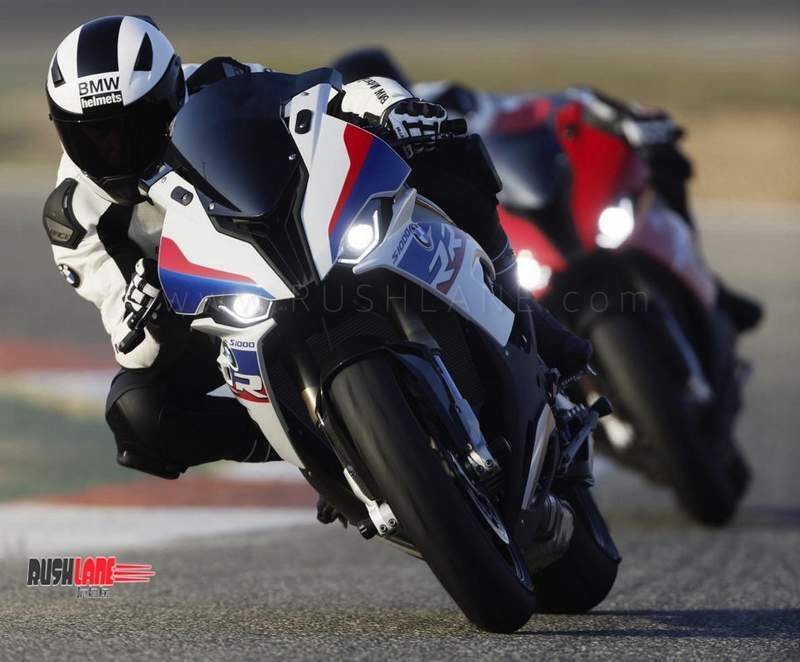 New BMW S1000RR is 8 hp more powerful and 11 kgs less heavier than the outgoing variant. After months of seeing spy shots, BMW has finally taken the veils off their all new flagship supersport machine – the S1000RR. At the EICMA show in Milan today, the 2019 BMW S1000RR made global debut. Powering the S1000RR is the same 4 cylinder 1 liter engine from before, but this one is tuned to deliver 207 hp (8 hp more than before). On top of this, overall weight has been reduced from 208 kgs to 197 kgs. Weight can be further reduced to 193.5 kgs with the M Performance package. Thanks to the enhanced performance, the new BMW S1000RR is atleast 1 second faster than the older machine in a drag race. The technology on offer – from traction control, wheelie control, ABS LED lighting, digital console, etc – is all upgraded to new generation and being offered for the first time in a BMW Motorrad machine. The engine is developed using BMW ShiftCam Technology which helps in delivering enhanced power in the lower and medium engine speed range and increased top-end power. The engine itself is 4 kgs lighter than before. Suspensions are completely revamped. Then there are four ride modes – Rain, Road, Dynamic and Race. These come as standard. In case you want more, then there are the Pro Modes, which are offered as optional extras. In this you get three more modes – Race Pr 1-3, each of these are freely programmable as per your convenience. – Increased output and torque: 152 kW (207 hp) (in the USA: 151 kW (205 hp)) at 13 500 rpm and 113 Nm at 11 000 rpm. – At least 100 Nm of torque from 5 500 to 14 500 rpm. – Newly developed suspension featuring Flex Frame, with the engine taking on more of a load-bearing function. – Significantly improved ergonomics due to Flex Frame. – Refined suspension geometry for further improved handling, increased traction and crystal-clear feedback in the threshold range. – New rear wheel suspension weighing 300 g less than before with Full Floater Pro kinematics. – Weight reduction of 11 – 14.5 kg to 197 kg when fully fuelled (DIN unladen) and 193.5 kg with M Package. – New exhaust system weighing some 1.3 kg less, with front silencer. – New 6-axis sensor cluster. – Engine brake function, adjustable. – Launch Control for perfect starts comes with “Pro Modes” option. – Shift pattern can easily be reversed. – Electronic cruise control as an ex works option.